This cake is probably the most interesting to date. My son was turning 7 years old. For two months I heard him tell me he wanted a "Pikmin" party. "Pikmin" is a video game for the Nintendo Game Cube. He loves it! If you have ever played the game, you would understand the cake a little better. My problem was, there isn't a party store that sells "Pikmin" party ware. What is a mother to do? I downloaded a picture of "Pikmin" and made postcard invitations on the computer. I went to Kinko's to make glossy copies of them to mail out. I also used the photo to make name tags for the favor bags. Since "Pikmin" products are not sold in the US, I went on eBay and found "Pikmin" figurines on sale. They were shipped straight from Japan in record time (2 days). I used these little guys on the cake. I know, some collector is probably going to freak out over it, but they DO look adorable all over this cake. Awesome cake!!!!! Love it! 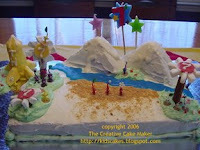 My son is turning 5 and I am going to attempt to make a Pikmin themed cake for him. Figures are extreeeemely difficult to find now, so I think I'll be making my own :/ lol wish me luck! Love love love this cake!! 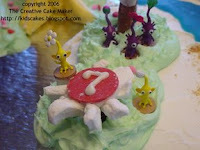 My son is turning 5 and I am going to try making him a Pikmin themed cake as he is a huge fan! The figures are extremely hard to find now, so looks like I'll be making these little guys by hand! Over 2 years later and your cake is still an inspiration! Thanks! My daughter is turning 5 and she has been playing pikmin 3 and loves it. Hope I can come up with something as awesome as yours.